Great wedding cakes deserve a great display – best done with Razatrade range of Wedding Cake Stands. 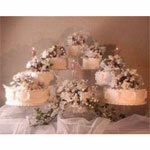 The wedding cake is the most eye captivating thing at the event which can’t be just kept on the table. Using decorative cake stands for displaying the cakes in different orientations and styles has become a new trend at parties and wedding celebrations. These multi-tiered stands can be used to elevate the charm of cakes, making the sweet desserts an eye-catching highlight of the event. From multi-tier stands to classic style table-turners, Raza Trade offers you with a wide variety of cake stands in the market best price range. These creative Cake Display Stands add one more element of surprise to your dessert table. Apart from giving your cakes a greater presence, these cake stands can be a perfect option for displaying dessert buffets. You can choose from our variety of coordinating stands to creative a swoon-worthy appeal. 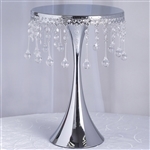 Make your cake decorations look photograph worthy with these designer cake stands. Place your orders for these decorative pieces online at Raza Trade and bring a little drama to your presentation. Why buy Commercial Grade Linens from RazaTrade?